Perhaps the most cringe worthy moment happened a month ago. My seven year-old daughter’s tooth was dangling from the top of her gums by a pink fleshy thread. I swear a stiff breeze would cause it to twitch. At the dinner table, my four year-old daughter kindly asked to pull it out for her. My eldest obliged. Even now I shudder recalling that moment when one sister did the other a favor by pulling out the tooth. I think the task of preaching on stewardship can be cringe worthy, for preacher and parishoner alike. And for many leaders in the church, attempting to generate energy around gracious giving to the church’s mission can feel like pulling teeth — except these ones aren’t baby teeth. There are undoubtedly several reasons why stewardship talk in worship and amid the communal life of the congregation can cause the faithful to cringe and shiver. I suspect one plausible reason is the unnecessary hype. That is, stewardship all too often comes once a year in the life of a congregation. That’s too much pressure on everyone involved. Your stewardship sermon on Stewardship Sunday better dazzle and deliver or the mission suffers! 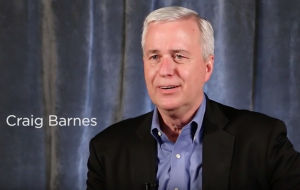 Through the lens of gratitude in this preaching moment, Craig Barnes offers another way to approach stewardship that may assuage the cringing. Craig Barnes states that gratitude, like stewardship, are themes “better woven in through the course of the year’s preaching, and almost any text will allow you to do that.” I agree. If the gospel bestows the gift of grace through Christ and calls us to live lives of gratitude to God through loving service to and with others, then our proclamation ought to be permeated by this gracious talk. The beauty of receiving the gifts of God is experienced most fully in the giving of these gifts of the sake of neighbor and the world. How, then, do we weave gratitude (stewardship) into the liturgical flow of the church year? Will “almost any” scripture text do, as Barnes suggest? Maybe. But even when a scripture text might not lend itself to gratitude, opportunities abound in congregational living. Every Sunday is a little Easter after all, and our response to the resurrection is steeped in gratitude for life’s victory over death! You lost your first tooth, and I am so proud. I flew into your room. Shhh! Not so loud. Asleep in your bed, you sure did not hear. Under your pillow three quarters appeared. Another quarter to save and cherish. And share it with others, for this I pray! When my daughter read the note, she began to weep. She was okay with saving a quarter in her piggybank, but the idea of giving one away made her cringe to the point of tears. Giving can be painful, as we all know. It involves sacrifice. But we insisted that she follow the advice of the Tooth Fairy. When she regained her composure, she reluctantly decided to share the third quarter with our church. My daughter’s weeping at the thought of giving was a hard moment also as a parent to experience, to be sure. But I will never forget how she beamed with pride on that next Sunday as her quarter rattled the offering plate. For that I am ever grateful.